The peaceful tranquility of a winter's night is captured on this beautiful set of return address labels from CheckAdvantage. Words from the Robert Frost poem "Stopping by Woods on a Snowy Evening" inspired the design. 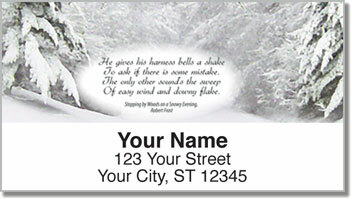 It will add artistic elegance to every envelope you send out. You'll also enjoy the fact that these labels are self-adhesive. Just peel and place them on all your letters and packages to make the task of preparing outgoing mail quick and easy. Order your very own Snowy Evening Address Labels right now! Get them with a set of matching checks.